I made this all by myself... Well... Except for the react logo... And the font... and the theme. React’s upcoming useState hook relies on array destructuring, let’s dive in and see how that feature works. 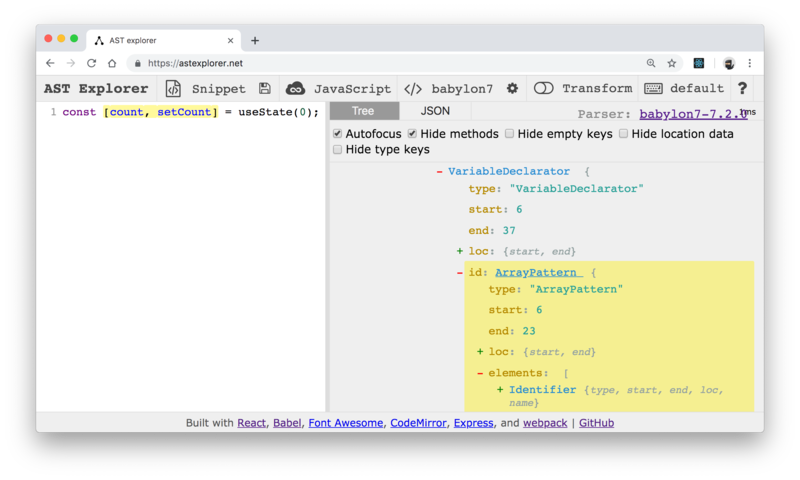 4  // Declare a new state variable, which we'll call "count"
Sweet, the first result takes us to "Destructuring assignment" where we can learn all about this feature (I guess you can read that instead of continuing here if you want to 😅). In computer science, syntactic sugar is syntax within a programming language that is designed to make things easier to read or to express. It makes the language "sweeter" for human use: things can be expressed more clearly, more concisely, or in an alternative style that some may prefer. Ok, so basically it means that there are common patterns or ways to write code in a given language, so the language makes a syntax feature to make that pattern require less code or more expressive. With this in mind, when I'm learning new syntax, I like to "de-sugar" the syntax to see what it would look like if we didn't have that feature. 😌 Phew, that's better. Ok, so what's going on here. Babel's taking our one line and rather than using the Array Pattern thing, it's assigning the return value of useState to a variable called _useState. Then it's treating _useState as an array and it assigns count to the first item in the array and setCount to the second one. Can I call the values whatever I want? Can I add more elements? Can I pull out fewer? I saw someone put a weird = sign in there, what does that do? Oooh, fancy, so if the first element of the array is undefined, then we'll set count to 3 instead. Default values! Sweet. Note: most of the things above you would never need to do with useState because we can always rely on useState returning an array of two elements! We'll look at that more next. Ok, so what does useState actually do then? What is it really returning? It must be returning an array for us to be doing the array destructuring like this right? Cool, let's check that out. One thing that's interesting is that the implementation of useState exists within react-dom rather than react. I know, that may be confusing because we import useState from the react package, but it actually just delegates to the current renderer (which is react-dom in our situation here). In fact, setState is the same way! 😱 it's actually just a hook that's using the useReducer hook! Ok, but what is that basicStateReducer thing huh? I hope you found this one helpful! Even if you already are very familiar with destructing syntax, the process of learning new syntax I show above has been helpful to me as recently as Friday when I was playing around with TypeScript. Seeing syntax that I'm not familiar with and learning new things is something that I'll never get tired of in this industry! And learning the fundamentals behind these bits of syntax will make you more effective at using them. I should mention also that there are more things you can do with destructuring and if you're interested there's a section about destructuring in my ES6 workshop that's available completely free on my YouTube channel. Good luck! Simplify React Apps with React Hooks - Let's take some real-world class components and refactor them to function components with hooks. Advanced React Component Patterns - Amazing patterns to make your components more reusable, flexible, and simple all at once. (Also on Frontend Masters). My YouTube channel is also full of content about React that you'd probably enjoy (including workshops, talks, and livestreams). DevHub - TweetDeck for GitHub by Bruno Lemos. The project itself is open source and pretty impressive. It's "a production app using React Hooks, React Native Web with a 95%+ code sharing between web and mobile, CRA, TypeScript, Yarn Workspaces and Redux"
What I Use: Kent C. Dodds - Byteconf is starting something new by talking to their favorite folks in the software dev world to find out how they do their best work. I was the first one!